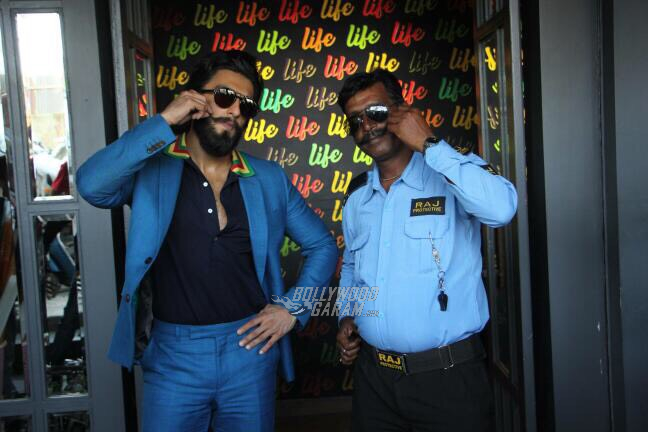 Home Actors Pictures of Ranveer Singh posing with a watchman will make your day! 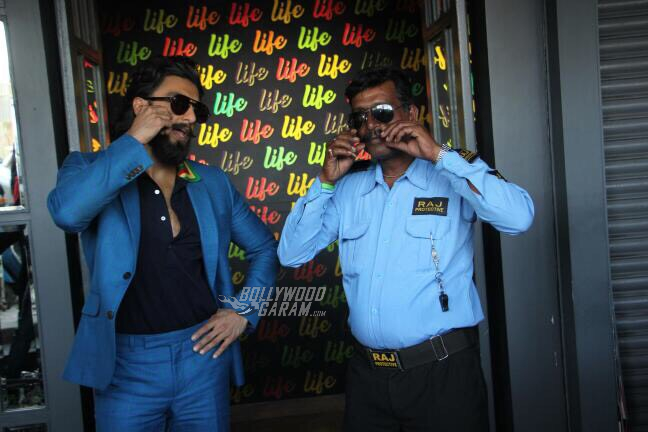 Pictures of Ranveer Singh posing with a watchman will make your day! Ranveer Singh is currently in Delhi and these photos prove that he’s making the most of his visit! Bollywood star Ranveer Singh is known for his outgoing nature and quirky fashion and today we saw Ranveer in one of his best avatars. The actor was in New Delhi today to attend an endorsement event for Carrera Eyewear. He looked dashing in a leather jacket and boots at the event as he posed on a motorbike and promoted the brand’s latest collection of glares. 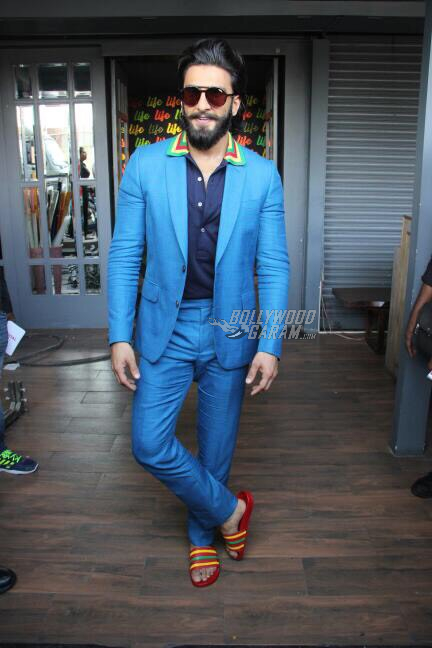 Post the event, Ranveer was seen arriving at another venue in an outrageously 90s inspired blue jacket with a rainbow collar! He paired the blue linen suit with a black shirt and brought back memories of angry young man, Mr. Amitabh Bachchan, from his earlier days. Adding more spice to the entire look, he completed it with bright red slippers with bright yellow and green highlights! From dancing in the middle of the road in Bandra, a few years ago, to sporting a chic 80s look at Mumbai airport yesterday, this actor has never failed to impress us. The fun photoshoot begins with matching poses. 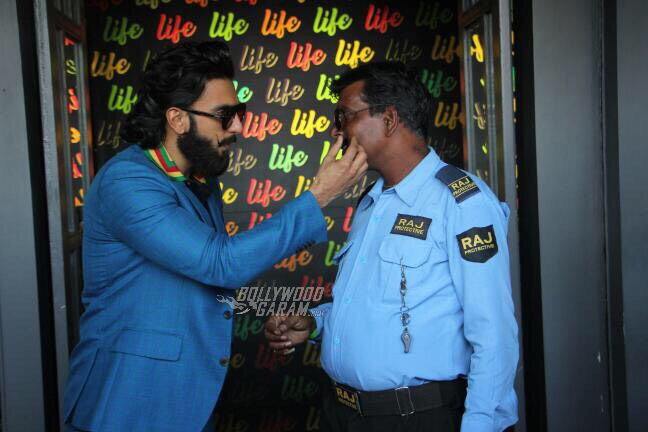 Ranveer and Mr. Watchman appreciate each other’s stellar beard. 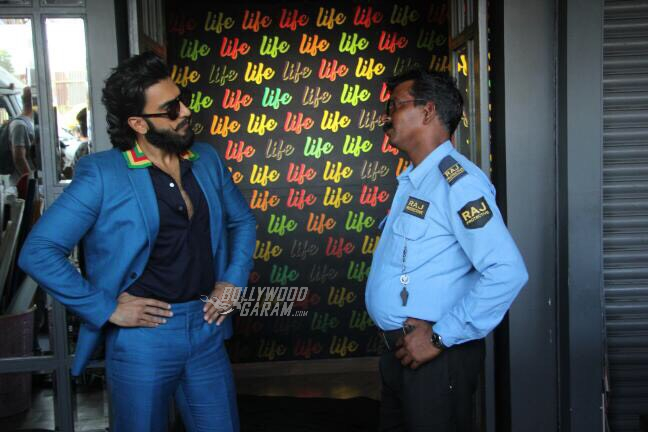 Ranveer styles Mr. Watchman’s moustache for the perfect click. This one is our favorite pick from the entire gallery. Did you notice his bright red collar matching chappals? 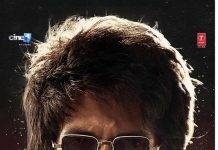 Stay tuned for more updates on your favorite star exclusively on Bollywood Garam. Next articleFinal Meri Pyaari Bindu Trailer Chapter 5 - Mix Tape is out!